Sunny to partly cloudy. High 84F. Winds WSW at 5 to 10 mph..
At 26 years old, Santa Rita coach Cody House says he is “relatable” to his players. “I can say, ‘Don’t do this,’ because I’ve done that,” he said. If you go to a Santa Rita High School football game, and you see a coach and his quarterback engaged in a heated debate — and the coach looks like he’s arguing with two people — it’s because he is. Cody House has two demons perched on his shoulder. One is Peyton Kendrick, his quarterback. “That kid wants to throw the ball every single play,” House said. The other is Cody House himself. Only it’s not the 26-year-old coach of the Eagles, but the Cody House of a decade ago — from the Cholla High School class of 2006, when he became one of the best quarterbacks in Arizona. It is a constant battle. The older, wiser House remembers what it was like to be a tackling dummy, sometimes too smart for his own good, often taking hits that would remain a memory for two weeks. He is a coach now, with the responsibilities and respect that go along with it, even if he’s young enough to be an older brother to most of his players. Instead, he draws a thick line, a wall in the sand. He sees himself more as a stepfather. That’s why the battle is so tough. He wants to be a running team — a tough, strong team. But the pull is there. It wasn’t that long ago that House was one of Southern Arizona’s best football players. He threw for 2,301 yards and 19 touchdowns as a Cholla senior in 2005, guiding the Chargers to a program-record-tying 9-3 record and a berth in the state quarterfinals — just the second in program history. House was named the Star’s first-team All-Southern Arizona quarterback. Nine years later, on Sept. 12, House’s Eagles defeated Cholla 20-0. The game was just his third as coach; it was cut short by lightning, ending after two quarters. House sprinted up the coaching ladder, taking rungs two at a time. Even in college, his passion was coaching, and he knew he would pursue it after he finished. There were no false illusions about a professional playing career. “I wasn’t trying to do Arena Football 2,” he said. After graduating from Western New Mexico in 2011 — he transferred there from Pima College — House latched on as offensive coordinator at Pueblo. A year later, he was named the freshman coach at Tucson High. And in January, he was plucked by Santa Rita to replace another ex-quarterback, Kris Heavner, who left the Eagles for Scottsdale Horizon. House had his mind set on a coaching career during his college football days, when he started to wonder the why, and not just the what and the how. The play call is the what, and the formation and scheme are the how. He hasn’t changed much, though the coach’s son now coaches with his father, Tyler, at Santa Rita. House is still in the “why” stage. He’s had to start looking at football from the defensive perspective, to aid his offense. He talks about football at a dizzying pace, like a scientist discusses electrons. Where there was once a gambler, all guts and skill, there is now a pensive thinker. He takes satisfaction in the strategy these days. He talks about a running play, where the fullback would go up the middle: Every team could see it on film, so he devised a counter off it. Need proof of the transformation, from chin-first high school quarterback to patient, analytical coach? Wait, what? This is Cody House, right? Cholla High, class of 2006? 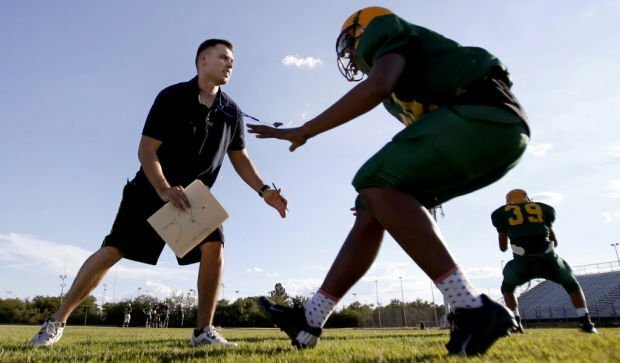 This is a story about one of Southern Arizona’s great high school quarterbacks, and how he learned how to coach from his back. He took a lot of hits at Pima, he said. Then there were the torn ligaments, and later, a torn MCL. It helps that the message is coming from a quarterback himself, and one who is not that far removed from high school. How many high school coaches in Tucson can say they graduated high school after Facebook began? But House takes the weight of the responsibility seriously. He respects his players and likes them, but he knows his role is not to be a friend. House is, at heart, a teacher. And he is, in fact, a social studies instructor at Magee Middle School. But it seems the message is getting through loud and clear. Kendrick respects his coach, along with the latitude he gets as a starting quarterback. There is wisdom in the words. Sometimes the old House will pop up, and he can’t be pushed down. House says he cheers too much on the sidelines. He’d like to act more chill. A couple weeks ago, walking onto that Cholla field, his heart started to pump. He felt it again. Still on that field was Cody House, Cholla quarterback, class of 2006.